The 154th Wing (154 WG) is a unit of the Hawaii Air National Guard, stationed at Hickam Air Force Base, Joint Base Pearl Harbor-Hickam, Honolulu, Hawaii. If activated to federal service, the Wing is placed under the command of the Pacific Air Forces. In 1989 with inactivation of the PACAF 326th Air Division, the 154th Composite Group took over the air defense Radar mission in Hawaii. The 169th Aircraft Control and Warning Squadron began operating a JSS radar site at Mount Kaala, Oahu along with the FAA, and the 150th Aircraft Control and Warning Flight operates a joint-use JSS radar site at Kokee Air Force Station, Kauai. These radar sites are linked to the NORAD Hawaii Region Air Operations Center (HIRAOC) at Wheeler Army Airfield, Oahu, 21°28′57″N 158°02′45″W﻿ / ﻿21.48250°N 158.04583°W﻿ / 21.48250; -158.04583﻿ (HIRAOC). 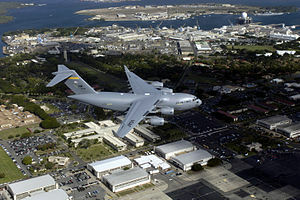 With these two sites, 24/7 air surveillance of the Hawaiian island chain is provided. The 154th Aircraft Control Squadron on Kauai also provides a mobile, self-sustainable, combat ready, forward extension and control element equipped to meet the Air Force's ground theater air control systems.